View Poll Results: Favorite Pie? Everything about pies, right here! Discuss your favorite pies, recipes for pies, obscure pies, the worst pie you've ever made/had, pictures of cool pies...etc. Recently I've been obsessing about my grandma's homemade apple pie...it is SO good, I swear she puts addicting things into it because I can't stop eating it! It's probably my favorite pie too! 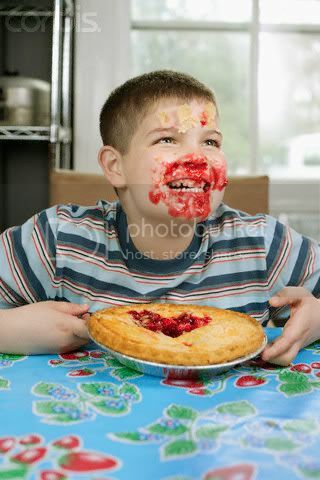 I love pie! I especially love apple pie -- and this apple pie recipe is delicious, with the port wine in the filling and the cheese in the crust. For the filling, combine sugar and cornstarch in lg saucepan. Stir in apple juice, port, butter and lemon peel. Cook over medium heat until mixture boils. Add apples and cook gently until barely tender. To make Cheddar Cheese crust, mix flour, salt and shortening with pastry blender until mixture resembles coarse meal. Stir in cheese. Add water gradually and mix lightly with fork to form dough. Divide pastry in halves and roll out one half to fit 9-in. pie pan. Roll second half of pastry and cut into 10 (1/2 in.) strips. Spoon filling into pastry-lined pan. Weave pastry strips across filling to make lattice top. Bake at 375 deg. 30 to 45 min. or until done. Serve warm. Occasionally you'll hear me complain about having grown up and lived my entire life in the Southern US (oppressive heat, Bible Belt, blah blah) but one thing folks around here know how to do is bake a delicious slice of pie. My grandmother passed away a couple years ago this month - she made the most amazing chocolate pie. Here's a recipe that's a lot like grandma used to make. Some people like to top it with meringue, but that ruins the perfection for me. Major weakness. Tart apple pie a la carte, with traditional flaky crust made with lard not shortening. Apples must not be mushy. And too much sweetness is nauseating. Want some. Want some NOW! Apple pie with ice cream is teh best. I also like blackberry pie with ice cream (ice cream IS a must on any pie for me), and pecan pie is delicious, disregarding my parenthesis for a moment, I do not need ice-cream for that. I voted Wildberry, even though I don't know exactly what you mean by that , but figured since my favorite pie if given a choice would be a doubleberry (like blueberry +raspberry) or tripleberry, that that was close enough. I also really enjoy cherry pies and apple pies. Wildberry is like some sort of any combo of berries...usually it's strawberries, raspberries, and blackberries, but any sort of concoction will do.